"How I learned to love exercise"
Lucy Mecklenburgh first appeared on our TV screens in the reality TV show The Only Way is Essex. She has also appeared on the BBC One show Tumble and Channel 4’s Celebrity Island with Bear Grylls. She authored the diet and fitness book Be Body Beautiful and founded her own online personal training and nutrition website, Results With Lucy. "I have a great passion for health"
Dame Kelly Holmes is perhaps best known for winning gold medals in both the 800 metres and 1,500 metres distances in the 2004 Olympics in Athens. In 2005 she was made a Dame Commander of the Order of the British Empire and retired from athletics the same year. 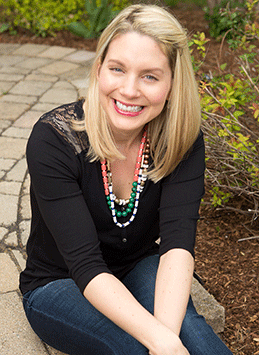 Anna Williamson is a television presenter, radio broadcaster, life coach and counsellor. 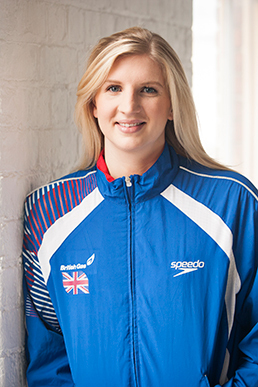 She was a regular reporter for Daybreak and Big Brother’s Bit on the Side and competed in the diving show Splash! The 37-year-old mum-of-one is also the author of the books Breaking Mad and Breaking Mum And Dad: The Insider’s Guide To Parenting Anxiety. International footballer Thomas Hal Robson-Kanu has played for Premier League team West Bromwich Albion since 2016. The 29-year-old played for Reading from the age of 15 and was one of Wales’ goal-scoring heroes during the Euro 2016 quarter-final victory over Belgium in Lille. Now, Thomas has developed a new turmeric drink after discovering the powerful health benefits of the spice. Here he tells us about his own healing journey. "My journey to becoming vegan"
"You have to live your best life"
Irish-born model and TV presenter Vogue Williams has recently appeared on our screens in shows such as Stepping Out, Dancing with the Stars and Bear Grylls: Mission Survive – the latter of which she was crowned the winner. The 32-year-old recently married Made in Chelsea star Spencer Matthews and the couple are expecting their first child. "My health and fitness tips"
TV presenter and fitness expert Chloe Madeley talks to Liz Parry about healthy eating, her favourite supplements and her daily training regime. "Healthy eating is incredibly important"
"My passion for the vegan lifestyle"
TV presenter Jasmine Harman has fronted the Channel 4 show A Place in the Sun since 2004. The 42-year-old mum-of-two has been a vegetarian since the age of six and a vegan since 2014. 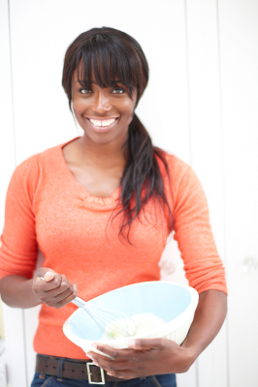 A qualified fitness instructor, she is passionate about health and wellbeing. As a member of the hugely successful pop-rock band McFly, Harry Judd has notched up five hit albums, a string of number one singles and sold more than 10 million records worldwide. 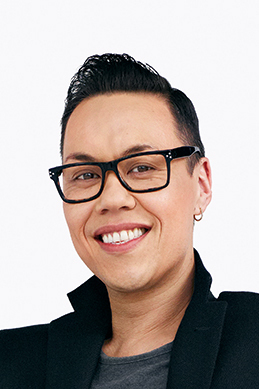 Proving that he has a natural sense of rhythm, the 32-year-old drummer went on to win the 2011 series of Strictly Come Dancing as well as the 2015 Christmas special. 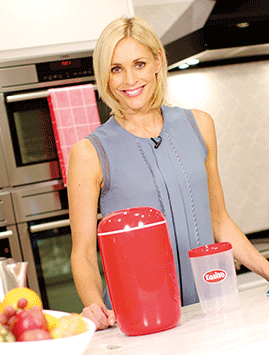 TV presenter Laura Hamilton talks about her love of exercise, how she beat her sugar cravings and how she juggles work and a busy home life. As a model, TV presenter and radio show host, Lisa Snowdon has been a familiar face on our screens for many years. 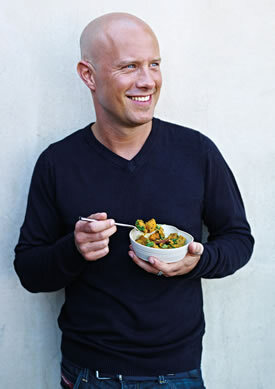 Here, Lisa talks to us about her latest project – a challenge to go dairy-free for 21 days. From haemorrhoids to halitosis, Dr Dawn Harper has seen it all during her time as a presenter on Channel 4’s Embarrassing Bodies. The 54-year-old TV medic can also be found helping long-suffering parents on Born Naughty as well as dishing out medical advice on This Morning and Woman’s Hour. "I'm fitter now than ever before!" Model and TV presenter Amy Willerton rose to fame after being crowned Miss Great Britain in 2013. The 25-year-old has since appeared on I’m a Celebrity... Get Me Out of Here! and, most recently, Channel 4’s action-packed winter sports show The Jump. 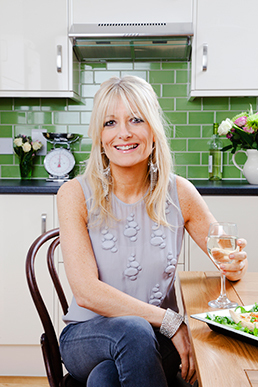 Organic living guru Jo Wood has been a leading figure in the natural health world for many years. The former wife of Rolling Stones guitarist Ronnie Wood has her own range of organic bodycare products and is a passionate campaigner for environmental causes. Jo, 62, was inspired to turn her health around after being misdiagnosed with the inflammatory bowel condition Crohn’s disease in 1989. When it comes to long distance running, Paula Radcliffe is one of the world’s best. The 43-year-old not only won the London Marathon in 2002, 2003 and 2005, but she also holds the women’s world record for the marathon with her time of 2 hours 15 minutes and 25 seconds. "Healthy eating can be fun"
Healthy food writer Ella Mills, better known as Deliciously Ella, has become synonymous with wholesome, plant-based eating. Since starting her blog in 2012, the 25-year-old has become a social media sensation. 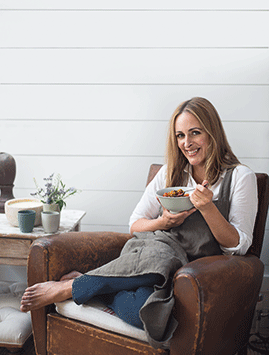 Her debut cookbook was Amazon’s biggest selling book of 2015 and Ella has since published two further books. 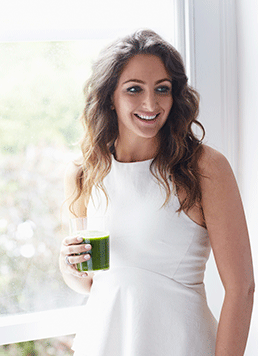 She has gone on to open two delis in London and has launched a range of natural energy snacks. "Mindfulness helps me to be my best"
Olympian Tom Daley is one of the biggest names in British diving. The 22-year-old first made a name for himself when he won gold at the European Championship in 2008, aged just 13, becoming Britain’s second youngest male Olympian of all time. "My tips for healthy living"
Yoga and nutrition guru Julie Montagu talks to Liz Parry about her passion for the plant-based diet and her favourite superfoods. "I lead a super-healthy lifestyle"
Singer Gareth Gates talks to Liz Parry about his healthy diet and exercise regime as well as his new foray into the world of natural products. 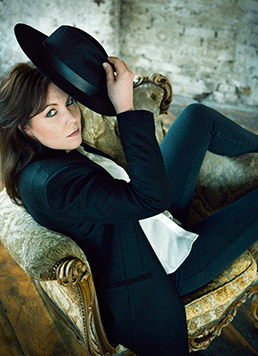 Singer and TV star Jane McDonald talks to Liz Parry about her impressive weight loss and new zest for healthy living. 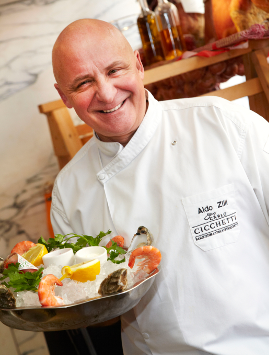 Celebrity chef and restaurateur Aldo Zilli talks to Liz Parry about his passion for healthy living and his involvement in our new cookery competition. Liz Parry speaks to musician and presenter Cerys Matthews about her upcoming outdoor festival and her passion for whole foods. Thea Gilmore - "Staying healthy on tour is a challenge"
Roxy Shahidi - "My passion for yoga"
Actress Roxy Shahidi is best known for playing Leyla Harding in the ITV soap Emmerdale, but she is also a qualified yoga teacher. The 31-year-old appeared regularly in Emmerdale from 2009 to 2012 before taking a two-year break. 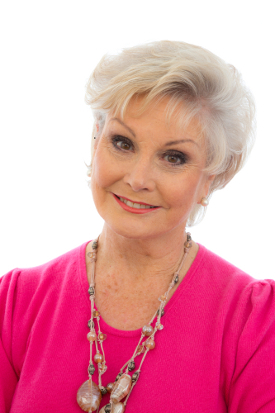 She has now returned to the soap but combines her acting career with teaching regular yoga classes in Nottingham. 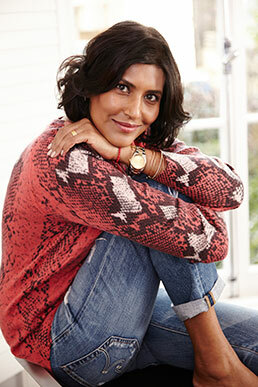 Anna Richardson - "How I lost weight with hypnotherapy"
Sunetra Sarker - "Strictly healthy!" Michaela Strachan - "My journey back to good health"
Lorraine Kelly - "Walking keeps me healthy"
Michelle Heaton - "My family give me strength"
Denise Van Outen - "My organic lifestyle"
Rebecca Adlington - "Swim when you're winning"
Olympic swimming champion Rebecca Adlington speaks to Liz Parry about her passion for healthy living, keeping active and, of course, swimming! 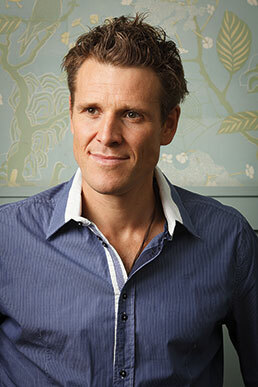 James Cracknell - "How I stay motivated"
Mel C - "My new fitness challenge"
Gaby Roslin - "My passion for healthy eating"
"Now, I’m finding that all the things I’ve been banging on about for years are coming to fruition, like cutting down on refined sugar and processed meat..."
Ruby Hammer - "My beauty masterclass"
"Focus on your good points and accentuate them. Don’t focus on your flaws or what you wish you could change"
Jessie Pavelka - "Get motivated!" 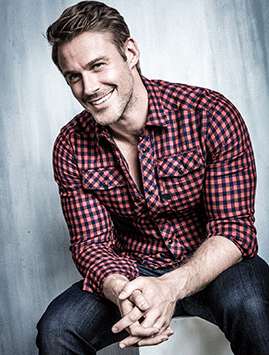 Fitness expert Jessie Pavelka talks to Liz Parry about his campaign to motivate the nation, plus how he juggles fatherhood and family life. Kristina Rihanoff - "Taking steps towards good health"
Davina McCall - "The 15 minute workout that keeps me in shape"
Liz Parry talks to interior designer Linda Barker about her love of healthy eating, exercise and holistic living. Kimberly Wyatt - "Let's dance"
Liz Parry talks to former Pussycat Doll and Got to Dance judge Kimberly Wyatt about her healthy diet and exercise regime. Weather forecaster and TV presenter Clare Nasir talks to Liz Parry about healthy living, meditation and mindfulness, plus how she overcame fibroids and fertility problems to have her ‘miracle’ daughter. Natalie Cassidy - "The older I get, the more confident I am"
Model, actress and TV presenter Linda Lusardi speaks to Your Healthy Living about how life in her second half-century is better than ever. Dr Hilary Jones - Doctor's orders! 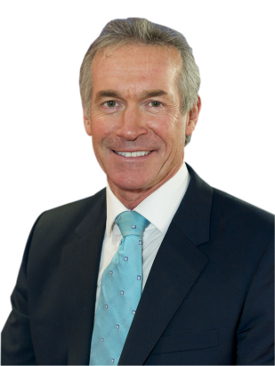 GP and medical broadcaster Dr Hilary Jones can often be found on our TV screens dispensing health advice, but here he talks to Your Healthy Living about his own health and fitness regime.